In case you haven’t been following this saga, I’ve been collecting studies funded by food companies since last March and posting them according to whether the results do or do not favor the sponsor’s interests. So far, I’ve reported 80 that do, versus 6 that don’t (although I have a couple more saved up for posting soon). The point of this exercise is to demonstrate that sponsored studies are far more likely to favor the interests of the sponsor than are studies funded by government agencies or foundations, and to argue for more independent funding of food and nutrition research (see my recent Viewpoint on this topic in JAMA Internal Medicine). Here are five more examples. Is consuming yoghurt associated with weight management outcomes? Results from a systematic review. J Eales, I Lenoir-Wijnkoop, S King, H Wood, F J Kok, R Shamir, A Prentice, M Edwards, J Glanville, R L Atkinson. Int’l J Obesity 2015 ahead of print. Conclusions: Yoghurt consumption is associated with lower BMI, lower body weight/weight gain, smaller waist circumference and lower body fat in epidemiological studies. RCTs [randomized controlled trials] suggest weight reduction effects, but do not permit determination of a cause/effect relationship. Well-controlled, adequately powered trials in research and community settings appear likely to identify a modest but beneficial effect of yoghurt consumption for prevention of weight gain and management of obesity. The ready availability of yoghurt (a nutrient dense food) and its ease of introduction to most diets, suggests that educating the public to eat yoghurt as part of a balanced and healthy diet may potentially contribute to improved public health. Funding: This project was funded by Danone Institute International. Conflict of interest statement: York Health Economics Consortium received funding from Danone Institute International to conduct this review. York Health Economics Consortium has received funding from the Global Alliance for Probiotics, Danone and the European Food Safety Agency for projects involving food and health topics. FJK is member of the Scientific Advisory Board Global Dairy Platform, Chicago USA RS is President of Danone Institute International ILW is employed by the Danone Company, France. Conclusion: The state of the epidemiologic science on red meat consumption and CRC [colorectal cancer] is best described in terms of weak associations, heterogeneity, an inability to disentangle effects from other dietary and lifestyle factors, lack of a clear dose-response effect, and weakening evidence over time. Funding: This manuscript was partially funded by Meat & Livestock Australia (MLA). MLA did not contribute to the writing, analysis, or interpretation of study findings. Comment: The conclusion of this industry-funded study contradicts the findings of the WHO International Agency for Research on Cancer, which finds processed meats to be carcinogenic, and red meat to be a probable carcinogen. The challenges of nutrition policymaking. Joanne Slavin. Nutrition Journal (2015) 14:15 DOI 10.1186/s12937-015-0001-8. 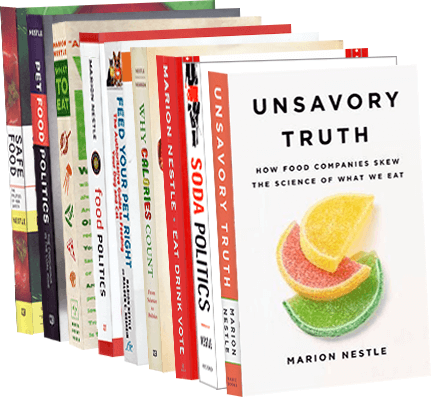 Thrust of paper: As every DGAC [Dietary Guidelines Advisory Committee] wants to be bold and set new direction, nutrition science would support that first we must do no harm with our dietary guidance. Moderation and variety must be kept front and center…A suggestion that all Americans should reduce sodium intakes is not sound and is potentially dangerous. Targeting certain foods and beverages, including chocolate milk, processed meats, added sugars, and even the noble potato as villains in the nutrition wars is not a science-based strategy and may need to be countered on the political front if appointed scientific review committees continue to take this approach. Competing interests: In the past 5 years Dr. Slavin has received research grants from Minnesota Beef Council, Minnesota Cultivated Wild Rice Council, Novartis Consumer Health, USA Rice, Nestle Nutrition, Tate and Lyle, General Mills, Inc., USA Pears and American Pulse Association. In the past 5 years Dr. Slavin has received speaking fees from food companies and commodity groups with interests in processed foods, dairy products, meat, pulses, fruits, vegetables, fiber, grains, and carbohydrates. Dr. Slavin has participated in scientific panels and advisory boards that are funded by food companies, ingredient companies, commodity groups, scientific societies, and trade groups. She holds a third interest in the Slavin Sisters LLC, a 119-acre farm in Southern Wisconsin. Conclusions: Overall, the balance of evidence indicates that use of LES [low-energy sweeteners] in place of sugar, in children and adults, leads to reduced EI [energy intake] and BW [body weight], and possibly also when compared with water. Conflict of interest: Peter J Rogers has received grants from Sugar Nutrition, UK in support of research on the effects of sugar on human appetite. Cees de Graaf has received grants from the Dutch Sugar Bureau in support of a study on brain responses to sugars and low energy sweeteners. Suzanne Higgs has received a grant from Canderel in support of research on the effects of low-energy sweeteners on human appetite. Anne Lluch and David J Mela are employees and shareholders of companies that manufacture products containing sugars and low-energy sweeteners. Peter Putz is an employee of ILSI Europe. Walnut ingestion in adults at risk for diabetes: effects on body composition, diet quality, and cardiac risk measures Valentine Yanchou Njike, Rockiy Ayettey, Paul Petraro, Judith A Treu, David L Katz. . BMJ Open Diabetes Research and Care 2015;3:e000115. doi:10.1136/bmjdrc-2015- 000115. Conclusions: The inclusion of walnuts in an ad libitum diet for 6 months, with or without dietary counseling to adjust calorie intake, significantly improved diet quality, endothelial function, total and LDL cholesterol, but had no effects on anthropometric measures, blood glucose level, and blood pressure. Funding: Funding for this study has been provided by the California Walnut Commission. Competing interests. DLK has been compensated for public speaking by the California Walnut Commission. The Journal of Public Health Policy (JPHP) will soon announce the retraction of a Viewpoint—an opinion piece—I co-authored with a Guatemalan physician, Dr. Joaquin Barnoya, “The food industry and conflicts of interest in nutrition research: A Latin American perspective.” Because of factual errors in the piece, and in response to valid objections about the errors from its subjects, they and we requested its retraction and JPHP is doing so. I believe it is useful to explain how this happened. In late summer, Dr. Barnoya brought to my attention an advertorial, a sponsored news account, published in el Periódico and other Guatemalan newspapers announcing an alliance among the Central American Bottling Corporation (cbc), the largest beverage distributor in Guatemala and bottler for PepsiCo; the Guatemala-based Institute of Nutrition of Central America and Panama (INCAP); and the U.S.-based Shalom Christian Foundation to distribute a supplemental food product, Mani+, to chronically malnourished children in rural areas (here is a translation of the advertorial). Mani+ is a sweetened, peanut-based, nutrient-fortified supplemental food made from local ingredients in Guatemala, used to prevent malnutrition in young children. The advertorial displayed a photograph of the directors of the three organizations holding the agreement. It also displayed statements from all three directors emphasizing the alliance’s importance in addressing childhood malnutrition. As readers of this blog should know, I have long been concerned about the conflicts of interest that arise when food companies—especially soda companies—enter into alliances with public health organizations. The New York Times made the consequences of such alliances clear in its recent revelations of Coca-Cola sponsorship of the Global Energy Balance Network and the fallout from those revelations. The announced alliance between cbc and INCAP raises similar concerns, particularly in the light of more general food industry partnerships with research and health institutions in Latin America. Our intention in writing the Viewpoint was to question the appropriateness of this alliance, as well as of other such partnerships and alliances. We should, however, have exercised more care. Shortly after publication of the Viewpoint, Carolina Siu Bermúdez, the director of INCAP who appears in the advertorial, wrote to object that our piece incorrectly implied a financial relationship with cbc, and that Dr. Barnoya had failed to disclose that INCAP paid a substantial portion of his salary via a grant from yet another organization. We also received letters from Dr. Edward Fischer, the founder of NutriPlus/Mani+, Professor of Anthropology and Director of the Center for Latin American Studies at Vanderbilt University, objecting to our statement that the alliance was responsible for manufacturing (rather than just distributing) the product. Both asked us to retract the Viewpoint. The alliance is involved only in the distribution of Mani+, not its manufacture (as we had asserted). The actual nature of the alliance between cbc, INCAP, and the Shalom Christian Foundation—who does what—is, in fact, unclear. The Viewpoint should have characterized the relationship with less certainty and specified that cbc has no financial relationship with either INCAP or the Foundation. Dr. Barnoya should have disclosed his financial relationship with INCAP, and I should have insisted that he do so. The Viewpoint was triggered by the advertorial, and we should have made this connection more explicit. The reference in the Viewpoint to the advertorial is incorrect. It is listed as (2015) cbc co. Unidos contra la desnutricion. INCAP, cbc y Fundacion Crisitiana Shalom Firman Convenio 23(July): 9. The correct reference is Alianza Contra la Desnutricion. elPeriódico. July 23, 2015;Advertorial: 9. In my books and other writing, I try as hard as I can to be precise and accurate. This incident is a lapse that I regret deeply, for which I take responsibility, and for which I apologize to Carolina Siu Bermúdez, to Dr. Fischer, and to my readers. I also apologize to Phyllis Freeman and Anthony Robbins, the editors of JPHP, and to Lucy Wheeler of Palgrave, who have set an exemplary standard of ethics and integrity throughout these investigations and discussions. As for lessons learned: Although I fully intend to continue to write critically about alliances between food companies and public health organizations, I also intend to use this experience to recommit myself to accountability and to diligence in checking and double-checking facts and disclosures going forward. Again, my deepest apologies. Addition, December 14: The actual retraction notice is published here. The discussion on Retraction Watch is here. Cocoa flavanols: science or marketing? Sunday’s New York Times carried this full-page advertisement. The ad directs you to the full story at nytinmes.com/cocoavia (where you see more ads). Now we have a full-page ad in the New York Times. CocoaVia is owned by MARS, Inc (this appears nowhere in the ad). Flavanols are usually destroyed during normal cocoa processing. Most chocolate contains few flavanols; CocoaVia’s process preserves some of the flavonols in very dark chocolate. Flavonol-rich or not, chocolate candy is not a health food. Like most conflicted research, this is about marketing—hence, the ad—not science.